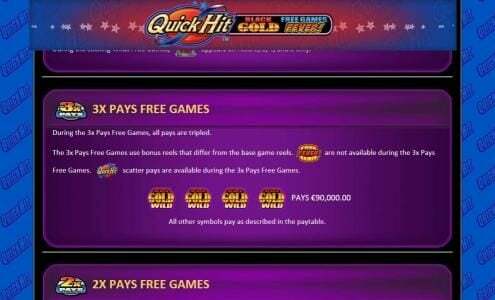 Quick Hit Black Gold Slots has not been reviewed yet, be the first to rate this slot. 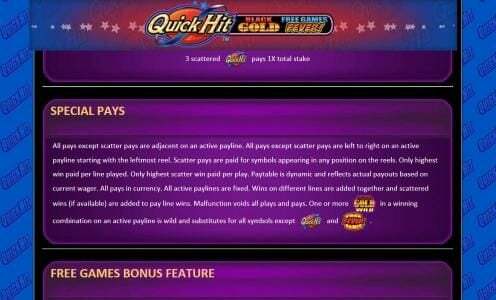 Bally Gaming’s Quick Hit Black Gold is a 5 reel game that offers 30 lines. 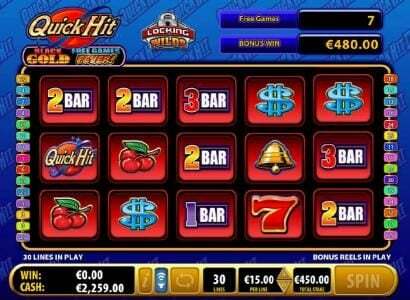 Among the multiple features offered there is the wild symbol, Free Spins and scatters. 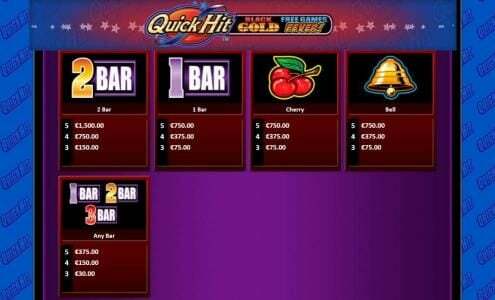 The top payout offered can put up to $30,000 in your pocket. 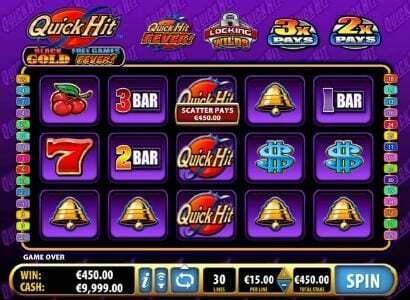 The game is a bit unusual in the way it looks and it does look dated, but that’s more because the symbols used are classics and we’re used to see them on ugly looking Slots. It’s not the case here and even though this is not a modern title it’s not one that you’d have a problem playing. The purple color is predominant in this case and you can see it both in the background image and on the reels behind the symbols and in the borders that go around them. 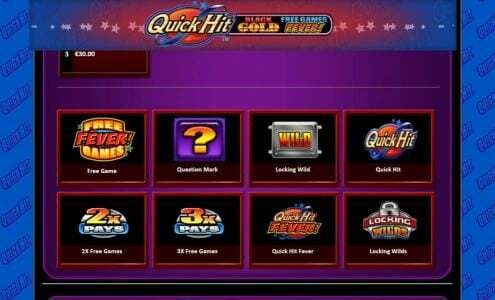 The top part is taken by the game logo along with a few examples of features that are present here. 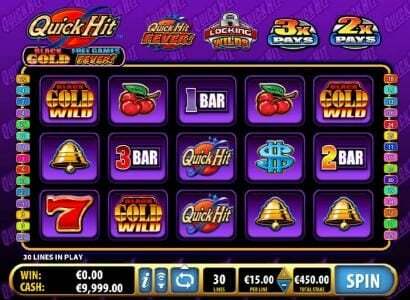 The various symbols appearing here have images with the Quick Hit log, the Black Gold Wild, the red 7, the Dollar sign, the 3 Bar, 2 Bar, 1 Bar, cherries and bells. 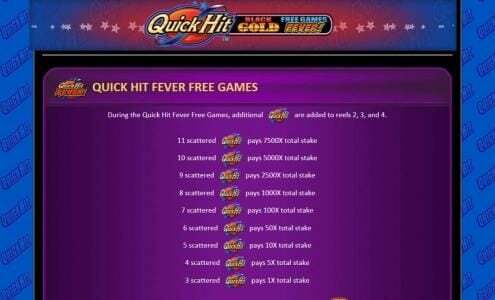 Multiple special symbols can appear, with Fever Games, Question Mark, Locking Wild, Quick Hit, 2x Free Games, 3x Free Games, Locking Wilds and Quick Hit Fever being their names. The betting system is a classic for these guys, with the line wagers starting at $0.01 and going up to $15. 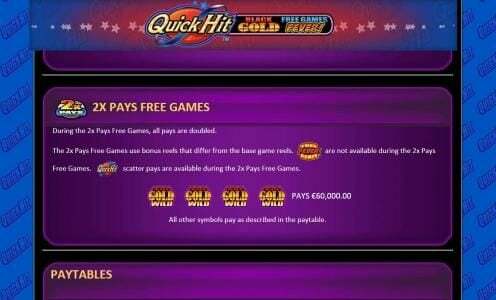 As always with Bally Gaming you will find that there is a fixed number of paylines with no option to change it. 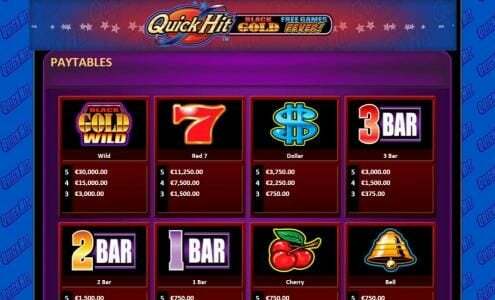 The total value of the bet is $450 and there are payouts of up to $30,000 on the line. 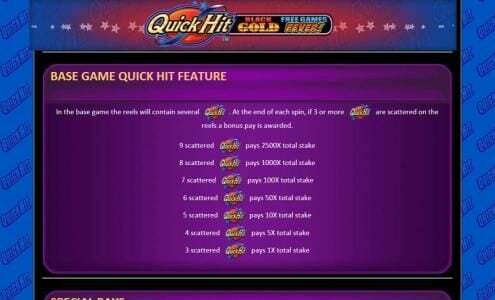 The Quick Hit symbol is one of the more profitable features of the game, if you can get it to show up enough times. 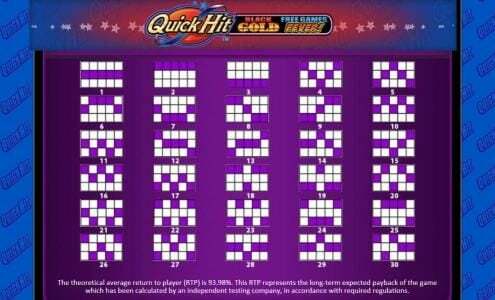 The minimum number of scatters of this type is three with the payout at 1x the value of the bet. 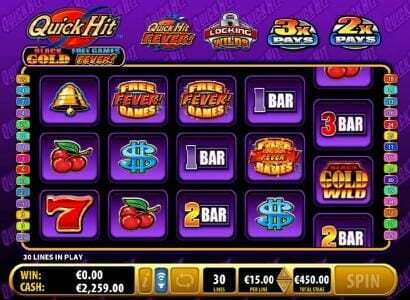 The prizes go up with each additional scatter and with 9 of them you get a payout of 2500x the total stake ($1,125,000 jackpot). 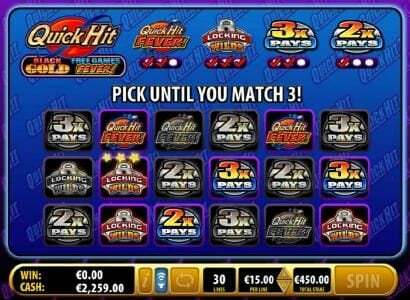 The Fever Games symbol can appear on the 2nd, 3rd and 4th reels. 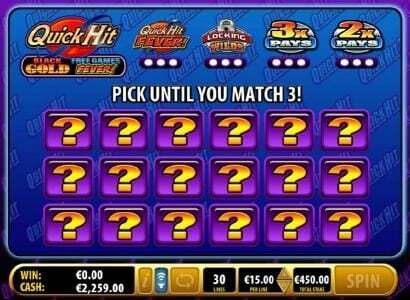 Get all three and you have 10 games for free. 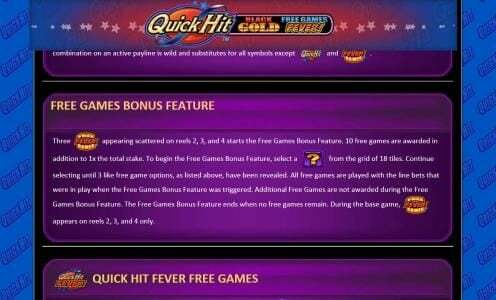 There are multiple types of free games with different types of Bonuses. 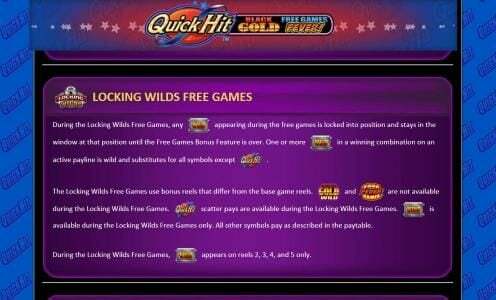 You can get multipliers of 2x or 3x, you can get locking wilds that stay in place and others. 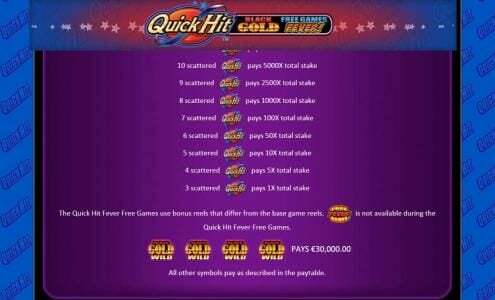 Quick Hit Black Gold has huge prizes that is can deliver and that makes it a go to Slot. 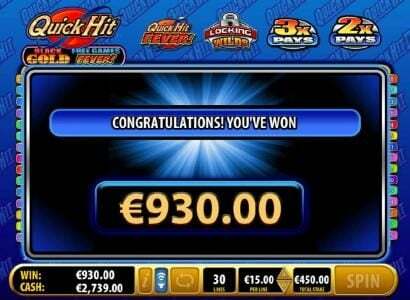 While you will find it quite difficult to get the larger payouts, it is still a good one to play.